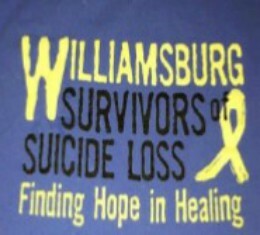 Williamsburg Survivors of Suicide Loss (SOSL) provides healing support for people coping with the shock, excruciating grief and complex emotions that accompany the loss of a loved one to suicide. It is important to know that people can and do survive loss by suicide. They are forever altered and may never stop missing their love ones, but they do go on to lead meaningful lives. Our support group was created in 2012 with a mission to recognize and respect the courage and resilience of suicide survivors at all stages of their personal journeys. We invite you to join our peer-led support group the first Thursday of each month from 7:00-8:30 PM at Hospice House & Support Care of Williamsburg. For more information, please contact Charlotte Moyler at 757-903-1641 or email: williamsburgsurvivors@gmail.com.